Washington, D.C., Democratic primary is last in nation. 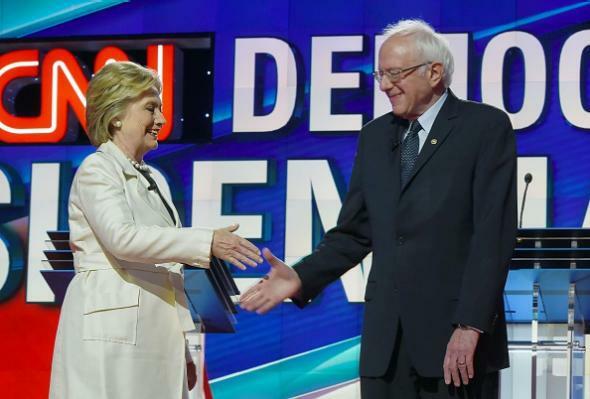 Hillary Clinton and Bernie Sanders at the Democratic debate in Brooklyn on April 14. Well, this has been fun, primary season, right? No? You disagree? It’s been “the worst,” and you’re going to move to a hermit cabin in rural Manitoba and never speak to another human being besides Bob, the proprietor of the local general store, ever again? Fair enough, fair enough. In any case, the last primary election is the Democratic on Tuesday in Washington, D.C., between Hillary Clinton and Bernie Sanders. Several people close to the senator, who spoke on the condition of anonymity to describe private discussions, say he will try to get assurances from Mrs. Clinton that she will fight for many of his campaign policy proposals, including a $15-an-hour federal minimum wage, a jobs program tied to repairing the country’s infrastructure, and tuition-free public colleges and universities. D.C. held Republican caucuses on March 12, by the way, in which party-establishment favorite Marco Rubio narrowly defeated John Kasich.